Offering up to six different media slots that can be used at the same time, the Sunbeam All Purpose Card Reader is an excellent way to pump up the usability of your PC. 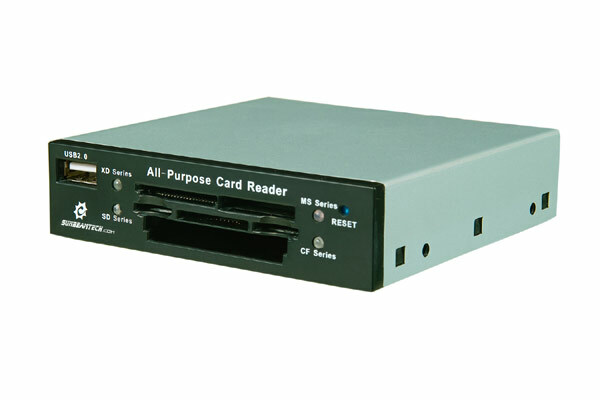 Ideal for desktop internal connectivity, the Sunbeam All Purpose Card Reader will fit perfectly into any 3.5" drive bay. In addition, this Sunbeam Card Reader also features USB 2.0 backwards compatibility, transfer speeds up to 480Mbit/sec, and both Plug n' Play and Hot Swap functionality. This Sunbeam Package includes All-Purpose Card Reader, Instruction Manual, and 4 Screws.